Combining a materially sensitive approach to design with respect for the context into which each project is placed, banduksmithstudio’s approach to design is via a series of systems; of pieces working together, attempting to transform the existing through introduction of the new; to redefine context and rediscover possibilities. Many a time, a single element or a miniscule nuance sets off an elaborate design process. It could be a passing thought or an erudite session of brainstorming..., one never really can tell what sparks off design. 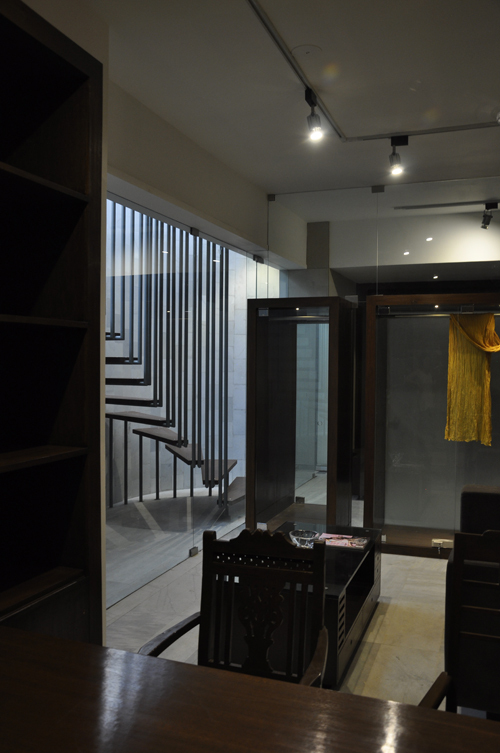 This premise finds a fitting echo in the works of architects Sachin Bandukwala and Melissa Smith, who together head banduksmithstudio at Ahmedabad. Encouraged by a keen desire to explore and learn, the practise is adept at addressing multiple queries simultaneously, identifying and working with a variety of scale, place, and material. 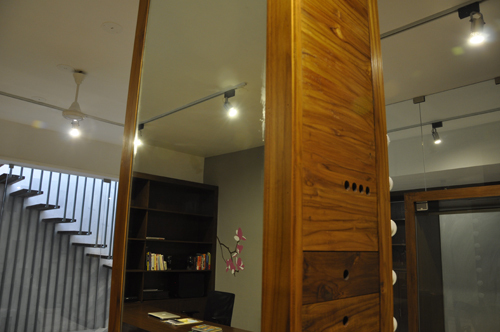 At the Magnolia office, located in the basement of a bungalow in a central neighbourhood in Ahmedabad, the creative duo found their big opportunity in an existing light well that was about 14’6” x 33” approx. Opening it up along the edge of the space, and making optimum use of its dimensional constraints, they inserted a curving stairway into place – that takes care of entry/exit; light and ventilation; and security, all in one stroke of genius. The space in question is a 700 sq. ft. carpet area designated for an image consulting office – at once cosy and professional, a mandate for the nature of the business. 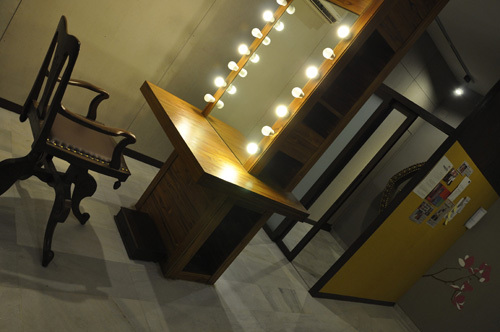 The office demanded two separate areas - one for support staff and waiting area, and the other more private, image consultant’s work space and client meeting area. Working with the singular element of the staircase, the exterior facade showcases a polycarbonate sheet wrap with curving MS members that diffuse light creating a mesmeric alley into the basement office. The stairs itself are designed such that each teakwood tread is suspended individually with two slim steel supports allowing light to penetrate, diffused by the translucent polycarbonate, protecting the stairs from above. The same steel supports, which are anchored above to the right of the tread and below to the left, form an effectively invisible security grill, facilitating an open adjacent wall, enclosed only in pivoted glass. This also facilitates a diffused glow of natural light and fresh air down into the underground space throughout the day. An integrated railing and support system doubles up for security, creating an intriguing element of design within the office space below. A sense of camouflage and stratagem imbues the small office with a character as intriguing as the profession it considers. 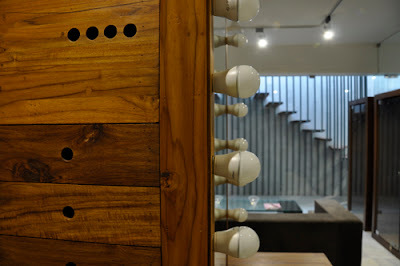 The main meeting area opens to the stairs and is complemented by a wardrobe with glass doors shielding garments, and a make-up table column, behind which is tucked an enclosed dressing area. Translucent cabinets mark the division of waiting and meeting, and simple clean surfaces are punctuated with colours and antiques. yes, a good opportunity to ask question about india's basements. i visited india recently spending about three weeks. i was lodged in an hotel with rooms having no direct links with the outside natural air. i.e. there were no windows and this gives the opportunity to have basements in same manner. i agree that electricity in india is 24/7, but natural and fresh air should be allowed by our architects to play its part in the life our human being. in nigeria, we dont have light for 24/7 but i was thought in the school of architecture that natural lighting and fresh air must be unhindered in residential buildings. during my stay, my room was humid and most of the time i have to stay at the hotel entrance to take fresh air. in the hospital too, same was the case. a lot of basements exist with large volume of activities going on in them. QUESTION. must we because of constant light supply forego these natural gifts that should promote healthy living. Beautifully done, indeed! Attention to detail brings design to another level!